one of the most important feature of my machines is their size. i want to have them as small as possible, because i want to take them with me whereever i may roam, to be able to make music when i’m in the mood for it. therefore i have built my modules in little toy like cases, to combine them depending on the space left in my suitcase. it all began with a book (s.wirsum, „sound schaltungen: töne und geräusche elektronisch erzeugen“, franzis 1989). built a few circuits out of it, but soon i recognized that those weren’t enough. i still love the sine generator circuit though and I still use two of them. around this time i discovered the internet with its possibilities to have a look at many great person’s work. so i began building circuits of ray wilson, ken stone et al. but you can never have enough modules. after a few years of playing with my little toys i got tired of this solution. so i’ve built a portable modular synth into one 19“ /12 units case. with as many modules as possible, one psu and one delay. the modules i’ve built into it had been carefully selected, depending on their functionality and versatility, and of course their sound. all the experiences i had gathered before flew into this project. it was finished in 2007.
very pleased with the results of this project and with all the experiences i had gathered i started to destroy my little toy like cases. i took the circuits out of those little cases and rebuilt them into another 19“/12 units case. with a few approvements and with a few new modules, of course. this project was finished in 2009.
still, you can never have enough modules. 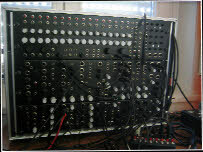 and i needed a synth to do live gigs, with as many modules as possible, as versatile as possible. 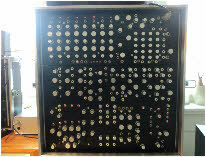 so i’ve built another portable modular synth, this time into one 19“ /14 units case. i’ve baptized this synth wladiwostok and built for it just modules i know by heart, so i know exactly which knob to turn during the gig. travelling with a modular is hard, so the versatility is a big issue. that’s the reason i used banana plugs for the first time, with nice knobs, too. the audience likes it! finished in 2015.